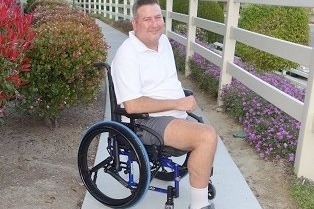 Can you please Help Mike Durnell….There is a double amputee who needs a very necessary and specially fitted manual wheelchair to function in his daily and difficult life. The wheels on a wheelchair are his legs. 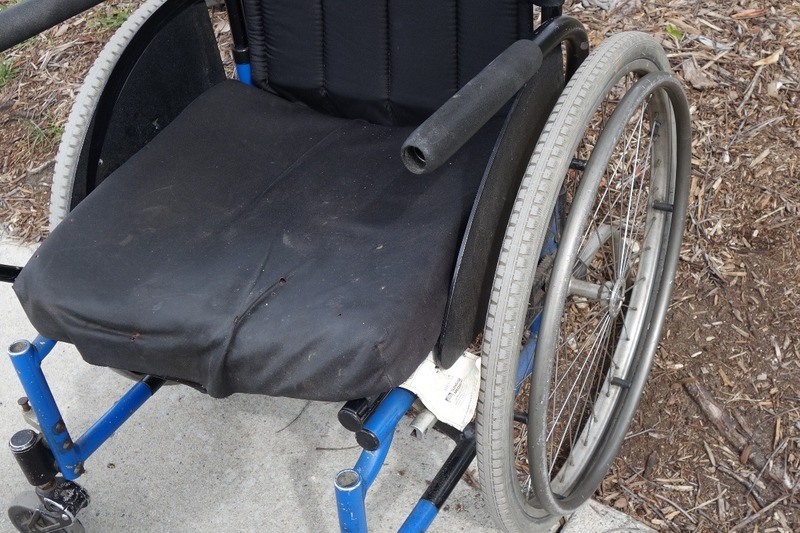 Mike has many special on-going medical needs but presently this wheelchair is essential for his mobility and his life. There is a very deserving amazing young man who would be so grateful for your kindness and your contribution to help him sustain some sort of quality of life and to raise his hopes that even if he can’t really walk among us, he can still reach for the stars and be a part of our great humanity. 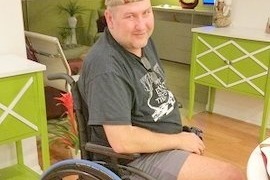 This man has many needs including a special manual wheelchair and the State of CA says he must wait another 5 years. The chair is so old, shredding into pieces, is broken and rusty and is no longer functional and yet, there he sits, having to deal with continuous pain and no resources. You might have seen Mike on the news media. He is someone you would never forget as he struggles with having lost both his left arm and left leg to an elderly driver who fell asleep at the wheel in the middle of a sunny Saturday afternoon. Michael was a senior at the University of California at Riverside and the 83 year old woman hit him head on in his lane and almost took his life. 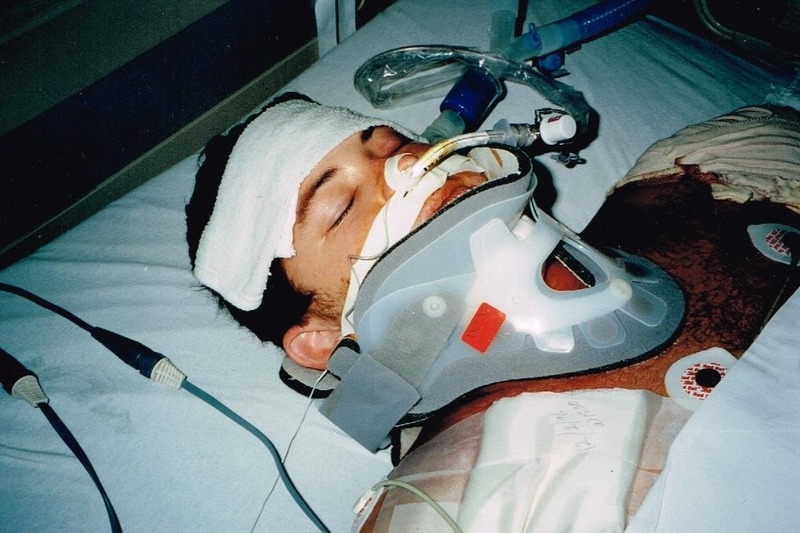 After many resuscitations, a long coma, severe head and brain injuries, fractures too numerous to count, 29 units of blood, 2 amputations, 36 surgeries and limitless procedures, multiple severe infections, more obstacles and then more surgeries, he is an example to the rest of us who can’t imagine a life like the one Mike endures day in and day out. You and I might give up but not Mike… Somehow he has been granted the greatest gift of all which comes down to loving life and appreciating every moment he is given. We might be heartbroken with a situation way less, yet he turns his great pain and his very limited ability around and comes out smiling, gracious, kindly and appreciative to have another day on this earth. Mike has tried so hard at walking again but because his leg amputation was up so close to his hip, and because he had no arm on the same side, his balance is off and at 6feet 4 1/2 inches in height, it is nearly impossible for him to ambulate for more than 5-minutes at a time. And then there are the many falls. Of course there is also the continuous agony-filled pain in his left shoulder where is arm was literally pulled from his body and this is something that he deals with day in and day out. These are hard subjects to comprehend but it's Mike's life right now. However, his heart is filled with the spirit of joy and gratefulness. Please know that this funding will go toward his many special needs, getting through the tough days and helping him to buy a very needed specifically sized and individually created manual wheelchair and they are oh so expensive. 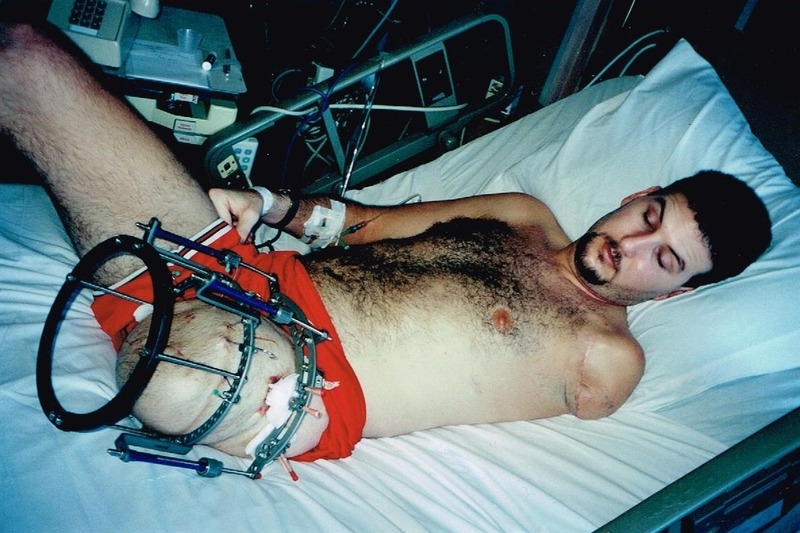 This will give him the ability to endure his ever so difficult daily life-long situations and to get around, meet people and maybe will even inspire the rest of us who can’t begin to imagine such a life. On behalf of our family, we genuinely thank you for recognizing that this is a tough yet remarkable situation and an outstanding opportunity to help this man who has the kindest soul and most genuine heart. We truly hope you can contribute in some way to brighten Mike’s life and help with his many on-going continuous Special Needs beginning with a very necessary and specialized manual wheelchair. Thank you to all of you folks who contributed to Mike's fund to make his dream come true. After 22 years of using the same manual bent up wheelchair, there he sits in his new Quickie custom chair and with a very grateful heart. 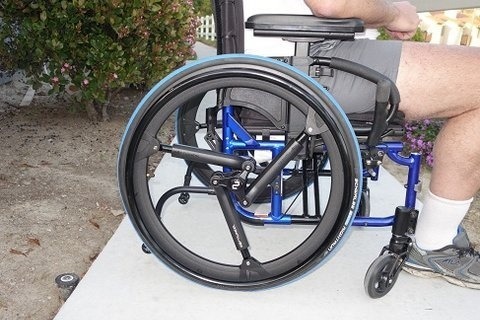 The chair has hydraulics that have 3 shock absorbers on each wheel so the bumps won't jar his shoulder. It also has solid tires so he doesn't have to pump air into them several times a week nor change the inner tube after riding over a thorn. The wheels are Mag wheels which replaces the spokes that always were getting things caught. Mike says that his new ride is soooooo smooth and just perfect. Thank you again for your generous support, kindness and encouragement. This has been a major goal in his ongoing struggle in life. You have made a wonderful difference. Here’s wishing you a wonderful Christmas season and a healthy and happy New Year. The news is that I have been measured for the wheel-chair of all manual wheelchairs. The order has been placed and now we wait until they customize it according to my size and special needs. Although the goal is a little short and many expenses continue, I am still looking forward to my “hot” new ride. If you see me in town scooting about, please come over so I can shake your hand. Thank you again for your kindness, support, upbeat encouragement and your friendship. 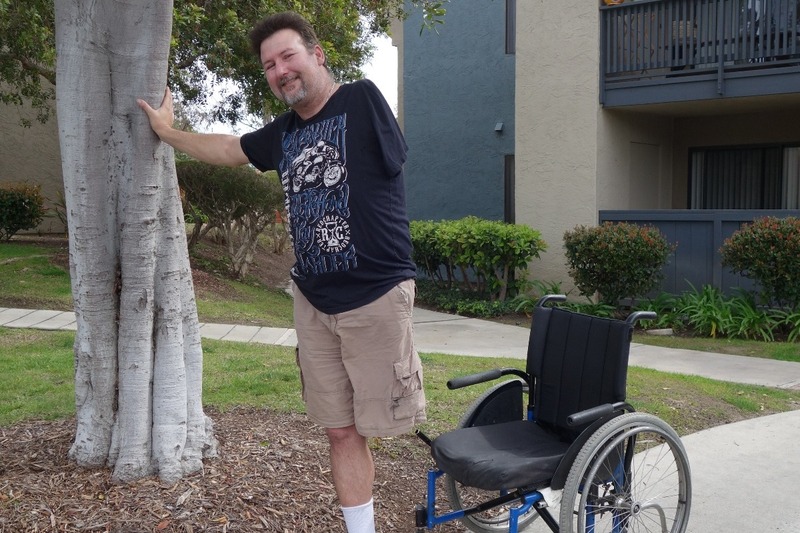 ...“Hi to my inspiring backers and champions of the cause to finally allow me to get a decent manual wheelchair after 21 years. There has been a temporary setback as I work on dealing with extreme phantom pain issues along with adjusting to my newly placed internal pain pump which seems to have created new and ever changing challenges for me. I do apologize for time slipping past but as the doctor says, it will take a little while for my body to make adjustments. I do however, long for a chair that is specifically fitted for me so I can get into tight places and have easier transfers to the car and wherever I might need to go. But most of all, a new chair made for my special needs will allow me more independence and freedom.